Summary: Vicki and I backpacked to Little Round Valley via the Marion Mountain Trail, then day-hiked to the summit of San Jacinto Peak the next day. We stayed a second night and then hiked back down to the car through an active logging operation in the National Forest. Vicki and I are still wondering what possessed us when we decided to carry our heavy backpacks up the Marion Mountain Trail. It must have been a case of temporary insanity. We’d never been there before, so ignorance is at least a bit of an excuse. But I really should have looked at the map a bit more closely before planning this hike. 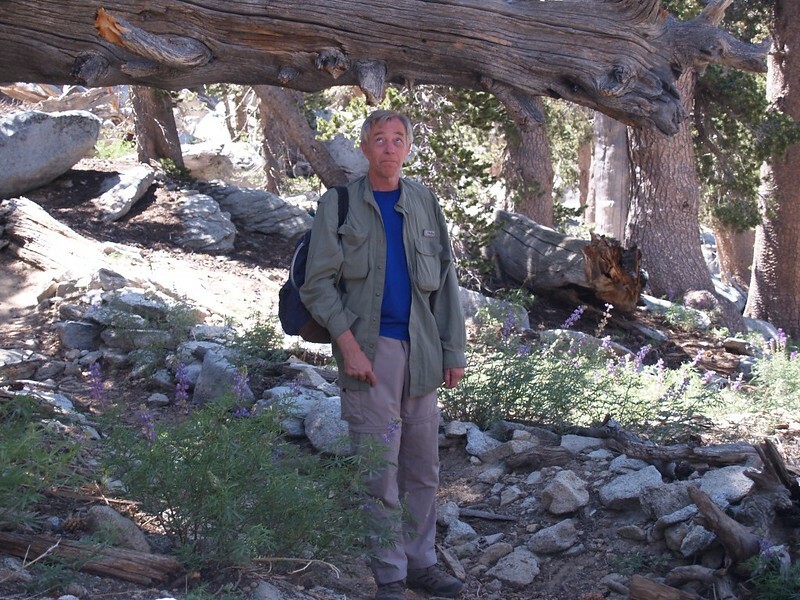 Many years before, we’d hiked the Deer Springs Trail to Little Round Valley (LRV) with the Boy Scouts. It was an incredibly long and difficult hike, and a number of younger scouts and their parents turned around and quit about halfway up. Thereafter, we called it “The Death March” and vowed that we would never hike it again. So this time I decided to take the shortest route to LRV. This seemed like a good idea. It was only a bit over four miles, well within our capabilities. Or so I thought. The part I didn’t take into account was that it climbed about 3500 feet to get there, meaning that it was extremely steep as well as short. Vicki doesn’t like steep, especially on her knees. Of course, she doesn’t like UP very much either, so let’s face it: Choosing this trail was a big mistake. In fact, I’ll probably be hearing about this fiasco for years. On that fateful day, we woke up in the wee hours, not long after midnight. 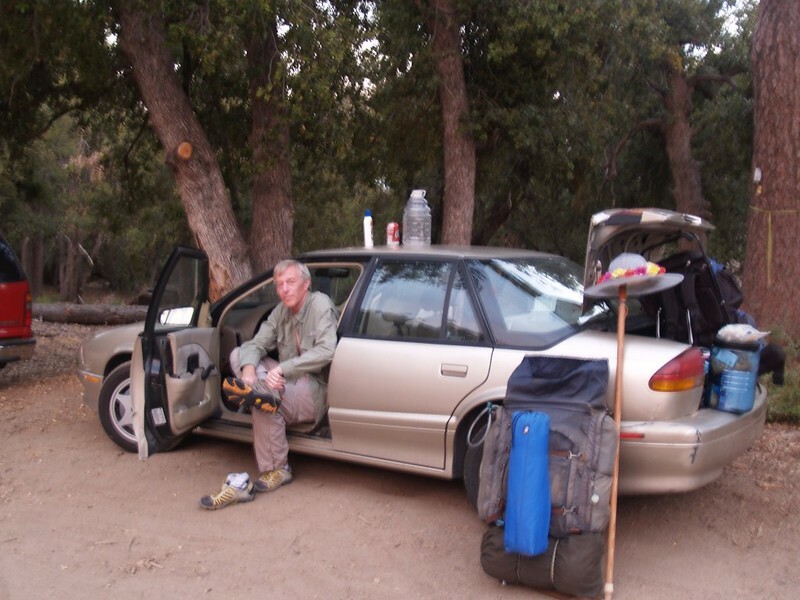 We finished packing the car with our gear and headed north at 3am, driving from San Diego to Idyllwild. It was just getting light as we arrived at the trailhead. We knew it was going to be an uphill hike, so we started early. We wanted to do as much of it as possible in the cool of the morning, although we knew that it would be hot later on. Still, the campground was less than five miles away, so how long could that take? Four hours? Hah! We’d be there by 10am! OK, maybe not that soon. Regardless, we were certainly destined to find out. 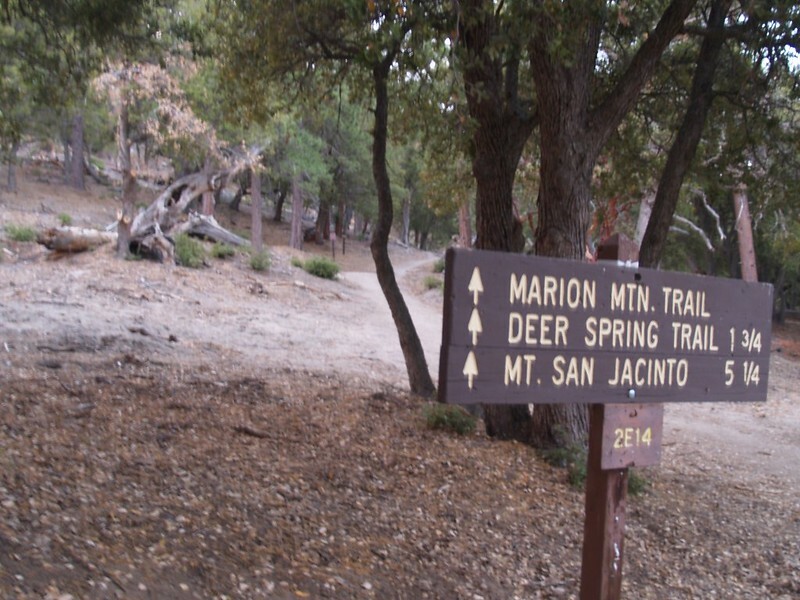 Marion Mountain Trail sign. That first 1.75 miles are REALLY steep. Probably why there are THREE up arrows! We put on our packs and started hiking. 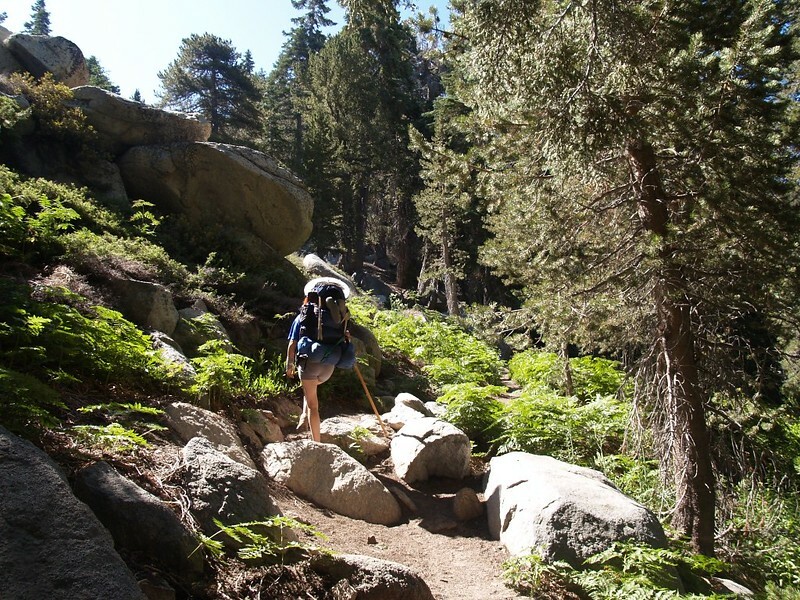 The beginning of the trail was fairly easy as it wandered along near the Marion Mountain Campground. This part may have been designed to lure us in deeper, so that we wouldn’t quit prematurely. And it worked! We foolishly headed up the steepest trail on the mountain. We discovered that there was a logging operation going on in the area. 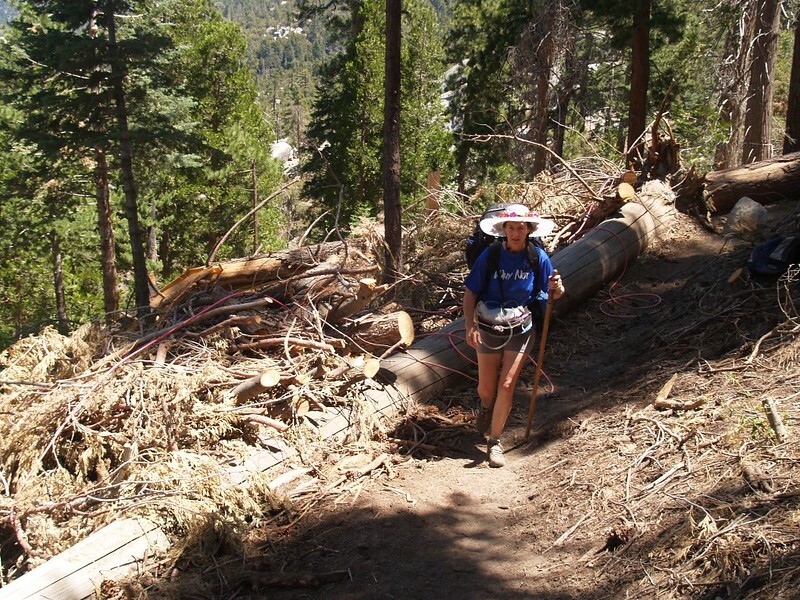 There were piles of logs positioned next to dirt roads that paralleled the trail. Interestingly, most of the logs were fairly small, between six and ten inches in diameter, which was a bit odd. Later on, as we hiked through the logged-out sections, we discovered that the biggest trees had been left alone, and the resultant forest was much more “airy” and open. We weren’t sure why it was done this way, but suspected that it had something to do with fire prevention. But nothing was happening today, as it was Saturday and the loggers had the weekend off. It didn’t take long before the trail got downright mean. It was steep and relentless. It would ease up a bit, so you’d think the worst was over, and then smash you with an even steeper and longer climb than before. Let me tell you: We took lots of short breaks to catch our breath. We could feel our hearts pounding in our chests, and the sweat was pouring off our foreheads into our eyes. This was one mean mother of a trail. After a mile or so (which took us two hours! Yikes!) we entered the state park wilderness area. 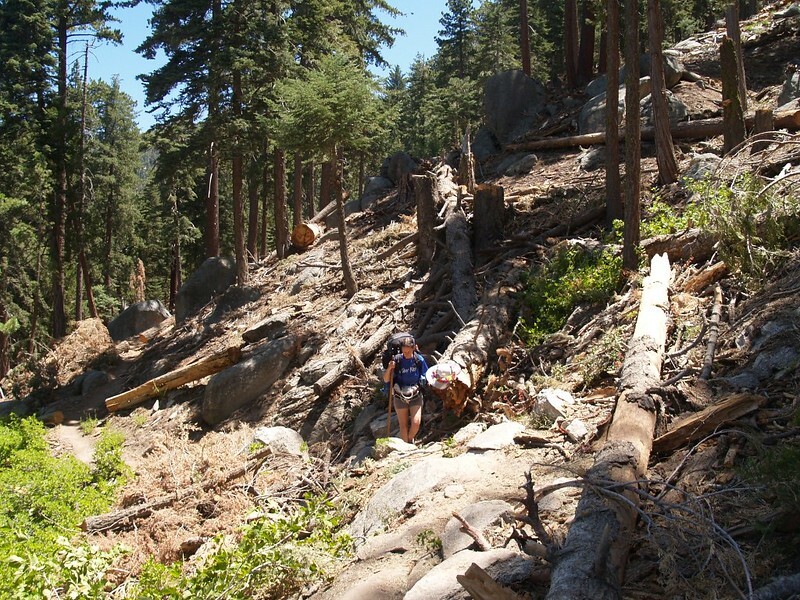 Wheels and motors aren’t allowed in wilderness zones, and the chainsaw-assisted logging was only allowed in the National Forest land. We immediately noticed how stuffy the forest became with all of that extra mid-size growth abundantly present. The cooling breeze we’d been enjoying was gone. The temperature rose along with the sun. And the trail got even steeper! We were sweating buckets in no time. Our micro-rests became ever more frequent. This was tough work! But there were beautiful spots, too, of course. It wasn’t a complete and utter sufferfest. 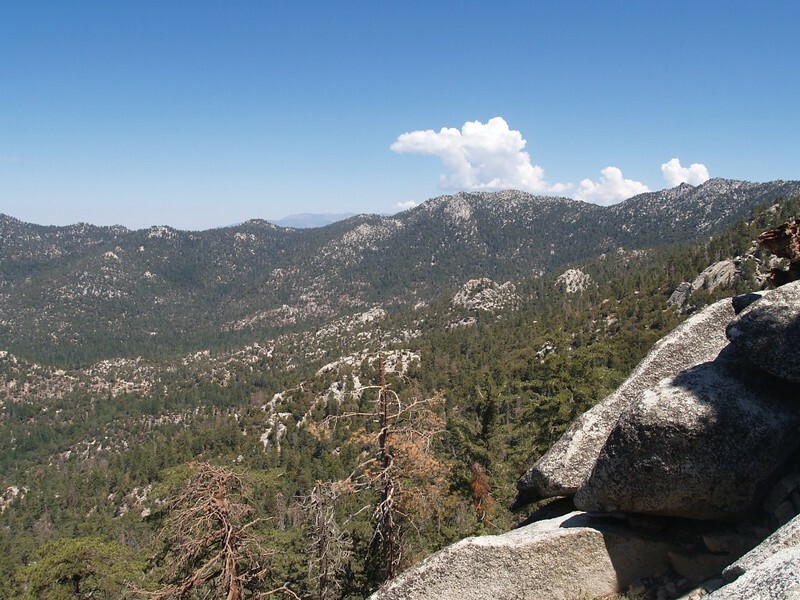 There were viewpoints from the top of granite cliffs where we stopped for longer rests, and there were moist cienegas with luxuriant growth and wildflowers. And, of course, there was always the forest, tall and stately and smelling of pine. Moist cienega with ferns and blooming lupines. This put a smile back on Vicki’s face. When you refuse to quit, you either die or you make it to your goal. We didn’t die. Just the same, it took us four full hours to hike the 1.75 mile Marion Mountain Trail with full backpacks! 2400 feet of climbing. It was brutal. And, thankfully, it was behind us. 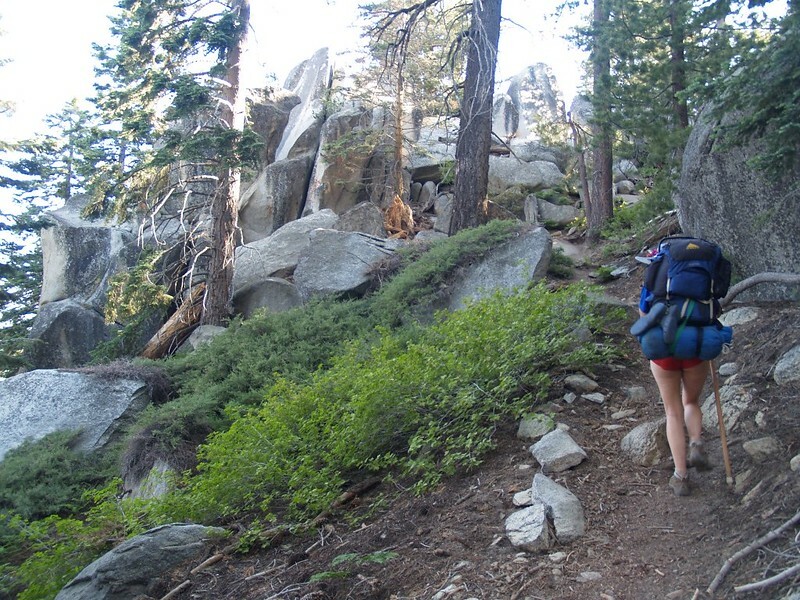 We took a short rest and then continued uphill (but less steeply) on the Pacific Crest Trail. 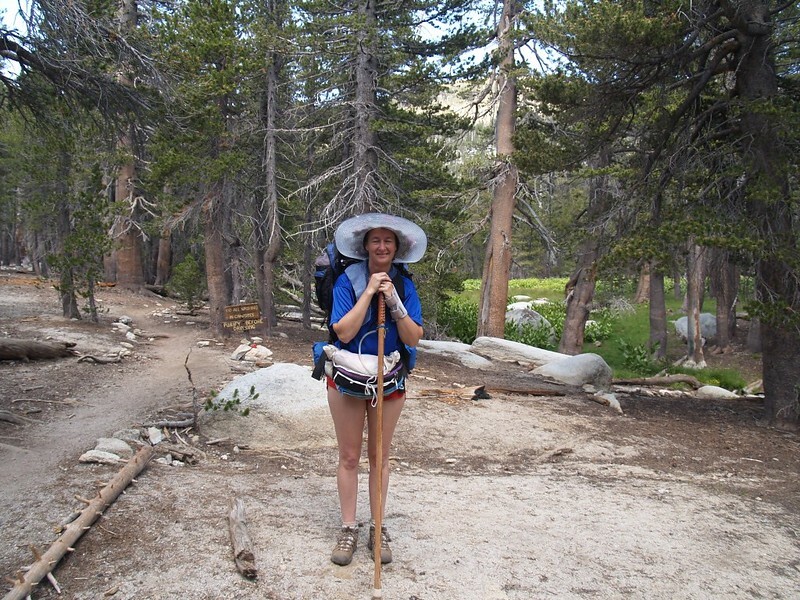 Vicki was hiking like a zombie by this time, one plodding foot in front of the other. She was seriously exhausted, but I urged her to continue just a wee bit further, to Deer Spring, where we could fill up on water and have some lunch. She was doing great, I insisted, and soon she’d be able to take a nice long nap in the shade. She nodded her head and continued plodding. Talking required far too much energy. What should have been a ten minute hike took over a half hour, but nonetheless we made it to the spring. 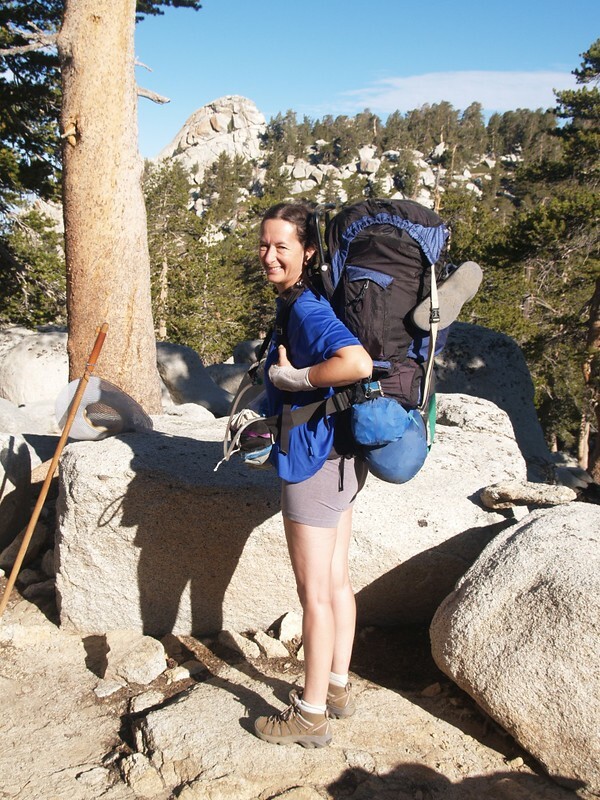 Vicki found a large granite boulder with a flattish top and dropped her pack. She curled up directly on the granite and was asleep within moments. No lunch, no water, no nothing. Just sleep. And she slept for over an hour! Boy, did she need it. While she slept, I got out my book and read for awhile. I took a few photos. Other hikers passed on by, and I held my finger to my lips to indicate silence, then walked a ways off to speak with them. Luckily, the stream was splashing and gurgling nearby, so we weren’t loud enough to wake her. Vicki was dreaming to the lullaby of the forest. Eventually Vicki’s system recovered and she woke with new energy. We filtered some more water and ate our lunch. We knew that there was plenty of water at the campground, so we only carried enough to make it up the next hot section of trail. All told, we spent about two hours resting and hanging out at Deer Spring. And it was worth it! 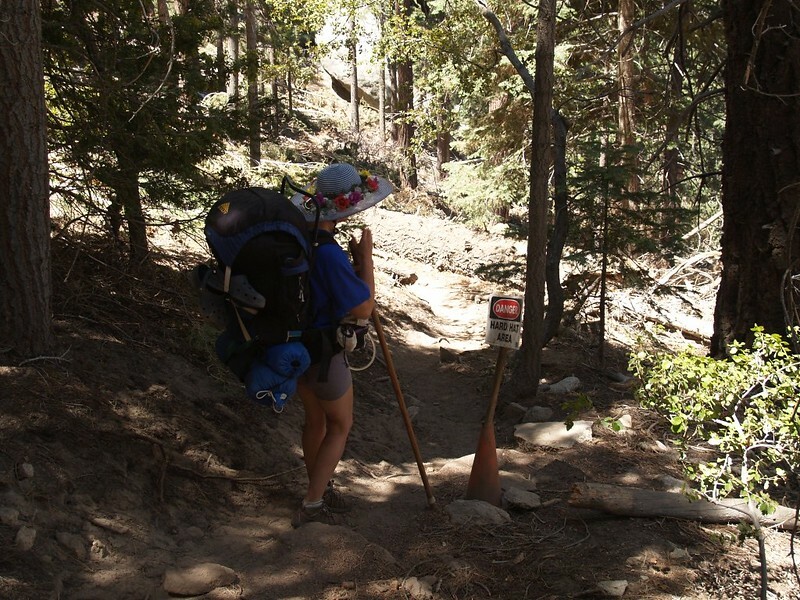 We continued hiking for another quarter mile on the PCT until its intersection with the Deer Springs Trail, at which point the steep climbing continued. The trail initially switchbacked upward through a buckthorn-covered slope. And the buckthorn hadn’t been trimmed in the past few years. Ouch! I was wearing long pants, so the thorns didn’t bother me much, but Vicki’s legs were getting seriously scratched. The only saving grace was that some clouds covered the sun for much of the time, and so we didn’t roast and burn while bleeding profusely. We had about 900 feet of climbing to do on this section of trail. It was about a mile and a quarter in distance, so the slope was steep but not insane like the Marion Mountain Trail, which had sections of 25% and even 35% grade. Parts of the trail were exposed to the sun, but other parts traveled through pine forest. Along the way we passed several small creeks which flowed across the trail. 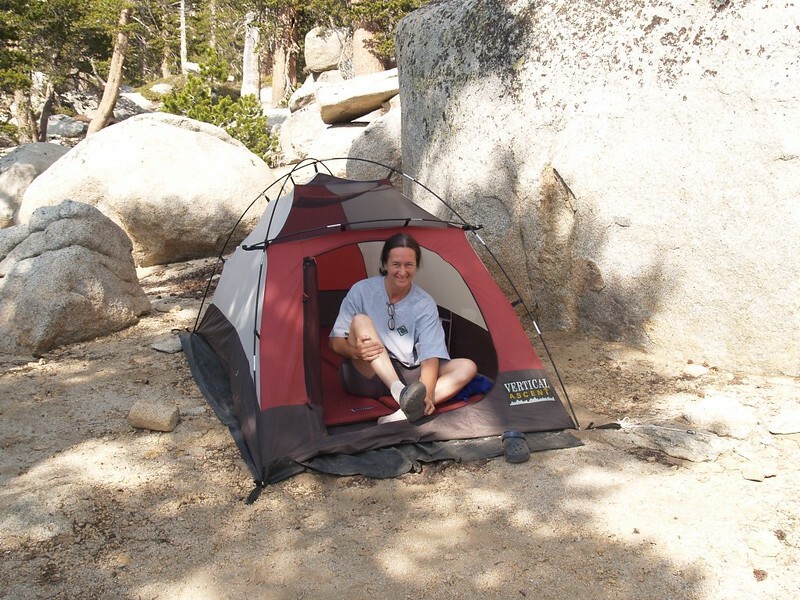 Vicki took yet another nap at “Bed Springs” and she was beginning to insist that the granite here on San Jacinto was positively “cushy” and comfortable! I call that opinion “exhaustion-induced delirium,” but she still swears that it’s true. Eventually, of course, we made it to Little Round Valley. What with all the rests we took along the way, that 4.5 mile trail took us NINE HOURS to hike! That’s a mighty 0.5 miles per hour. Yes, we admit it: We were pretty darned slow. Of course, you could also look at it another way: We climbed 600 feet per hour, or about 10 feet uphill per minute, hour after hour after hour. And that’s all because we refused to give up. It also helped to start at dawn. Vicki was tired but happy when we finally saw the wooden sign at the campground. Now all we had to do was find an official camping spot. So we hang a left at the first side-trail and headed uphill to a decent spot, but we didn’t like it as much as the spot down below us, so we headed that way. We found some nice soft sand next to a big boulder and set up the tent. We inflated the air mattresses and put them inside. We took out our spare clothing and sleeping bags and tossed them in as well. Then we took yet another long nap. We spent the rest of the day simply enjoying the mountain. 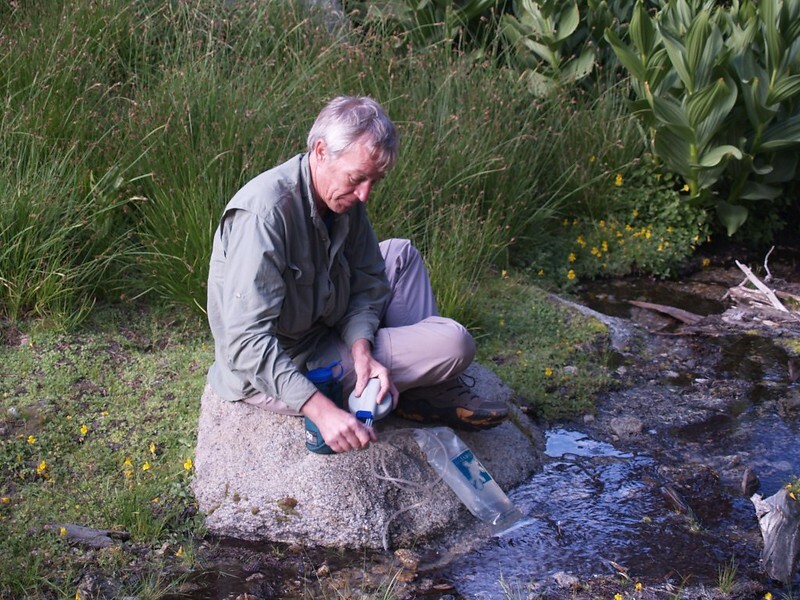 We took a short walk and filtered a gallon of water from the stream in the meadow. We ate an early dinner, then took a longer walk around the campground, and discovered an old “Seasonal Ranger Station” that was quite dilapidated and unoccupied, even though this was prime camping season. 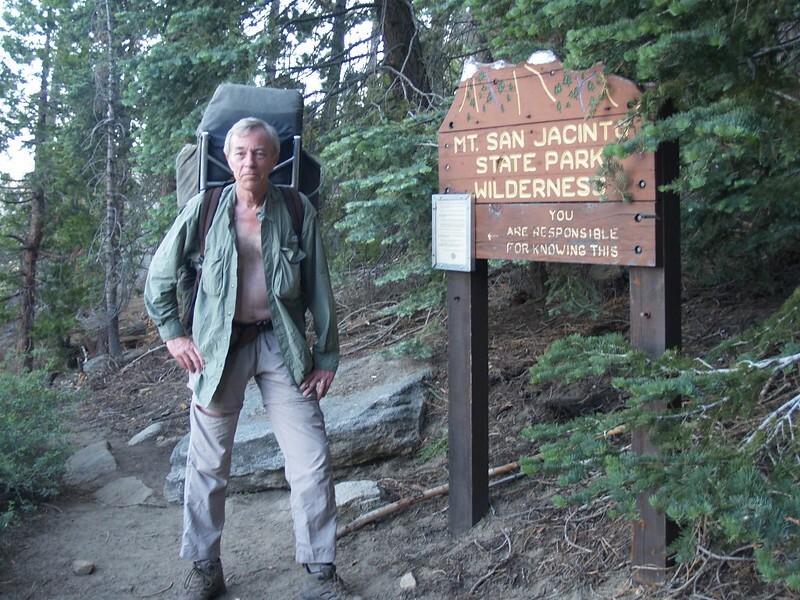 Times change, and so do staffing budgets, so we didn’t expect to meet a ranger up here. After that, we enjoyed a mellow sunset and headed off to bed. We’d had one heck of a long and arduous day. It was a bit on the cool side that next morning when we woke up, and the tent was in the shade. We got dressed in the tent and added an extra layer of raingear over the top of our light hiking clothes. Then we went outside and cooked up a bit of freeze-dried scrambled eggs. They were really good, unlike the “powdered eggs” that I’d eaten back in the time when I was a boy scout. Hooray for technology! And never let them tell you that the “good old days” were always good. 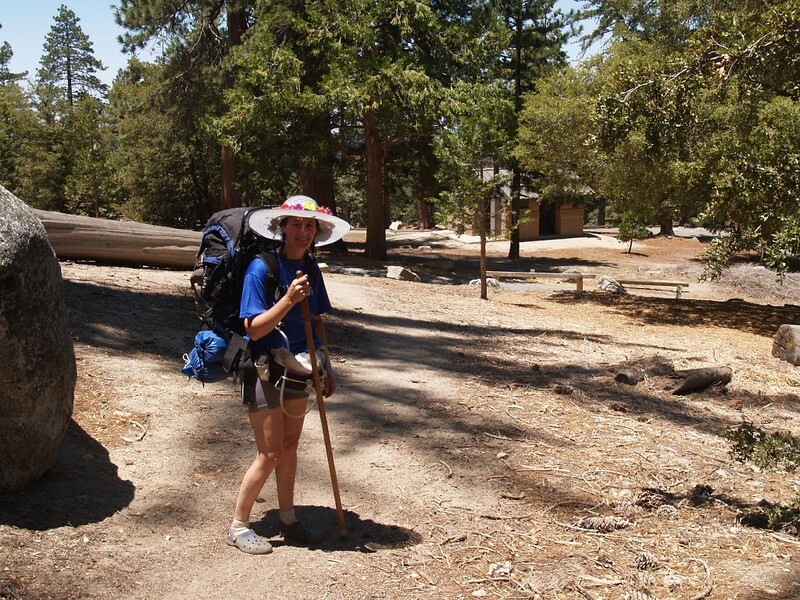 We packed up a day pack with some snack and lunch and headed down to the main trail by the meadow. I stopped and filtered enough water for our hike to the summit while Vicki wandered around enjoying all the lovely wildflowers. Everything was green and blooming along the tiny stream. It was only a mile and a half to the summit, so today was going to be an easy day. We certainly deserved it after hiking the Marion Mountain Trail. But we also had to climb a thousand feet to get there, so we weren’t being totally lazy. As usual, we decided to hike uphill fairly early in the morning. Partly this was because it was cool and shady at that time, but mainly because we wanted to beat all the “tram” hikers to the summit, so that we could have the top of the mountain all to ourselves. The first tram of the day was at 8am, and it was a five mile hike. We were quite confident that we would arrive first. 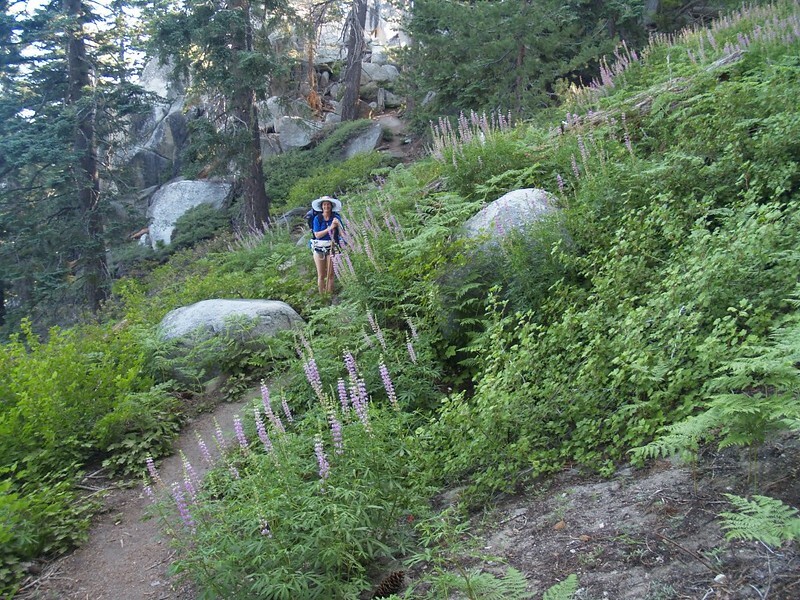 So we climbed the switchbacks and enjoyed the pines and the flowers as we went. The lupines were blooming, and their scent was sweet and strong, like walking past a candy shop. We were really enjoying the hike, especially without those big heavy backpacks. It was turning out to be a beautiful day. 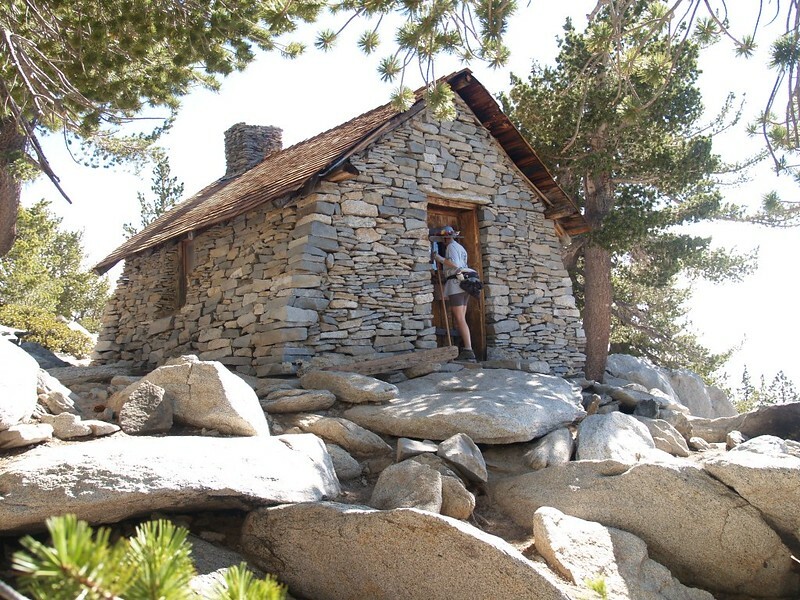 We came upon the stone hut when we neared the summit. We went inside and checked out some of the emergency gear that folks had donated. There was a cupboard with some food and a bunk bead with two sleeping bags. We supposed that if times were tough and you couldn’t descend from the peak you could use this place to survive. The original fireplace was all bricked up, which was probably a good thing as the entire roof probably would have burned by now, thanks to careless campers. 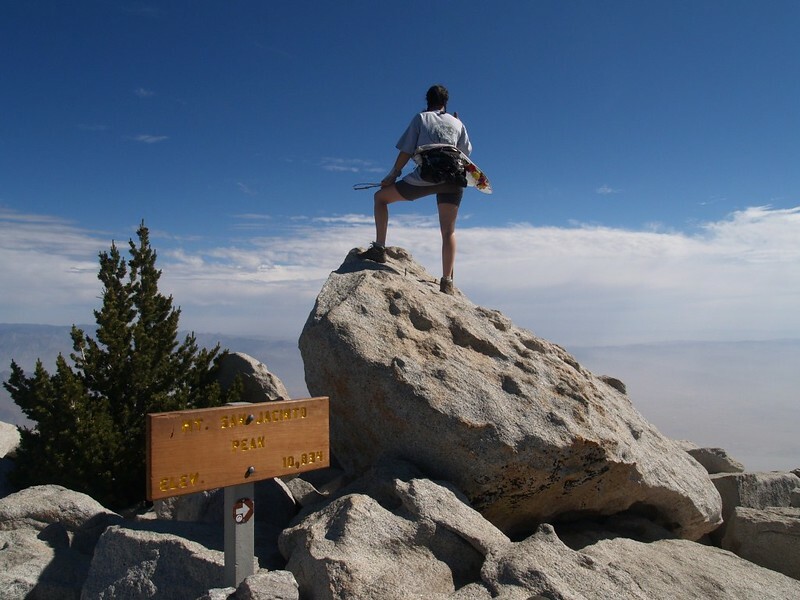 After that, it was a fun scramble over big granite boulders to reach the actual summit. 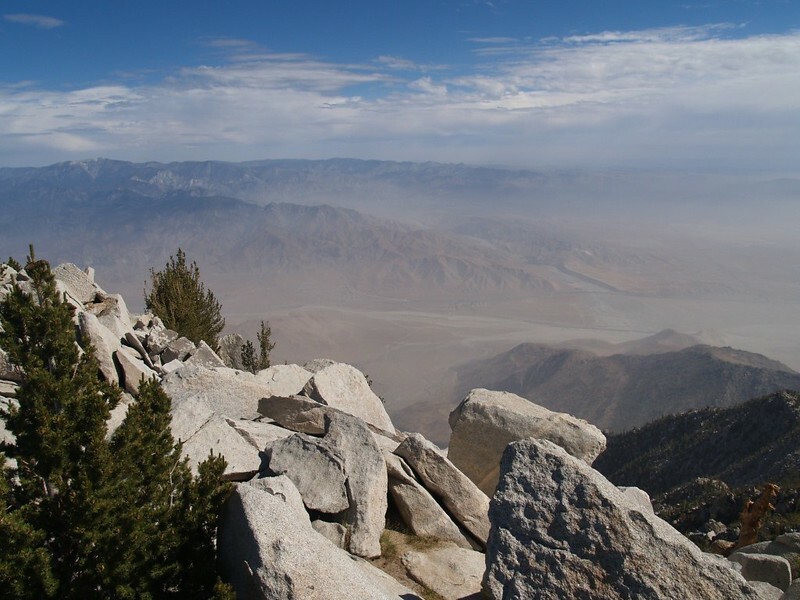 We’d been here before, and it was definitely worth the effort for the views. The day was a bit on the hazy side, but the visibility was still quite good. As we’d hoped, we were the only ones on the top. We had the place to ourselves, and took all of the requisite photos. The only downside was that we didn’t have somebody to take a picture of both of us. Oh well, another time, perhaps. 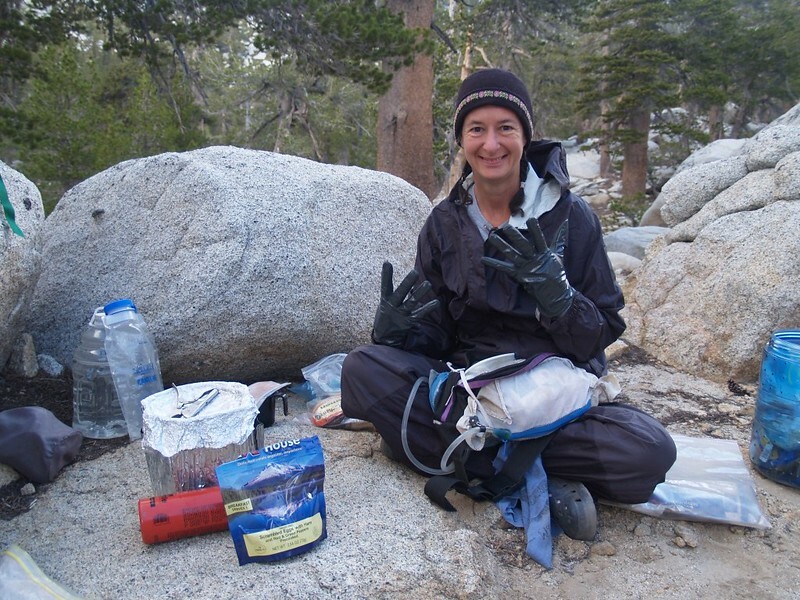 It was a bit breezy up there, so we hunkered down in a small clear patch next to some low pines and ate our snack. A few people arrived, but not from the tram; they were camping down below in Round Valley. Everyone was friendly, as they always are in the mountains. Vicki began futzing with her gear. She got out a piece of rope and her bandanna, then found a few small pine branches that were on the ground. She began assembling a crazy kite contraption out of it. She wanted to fly a kite in that lovely breeze up there. I shook my head in disbelief. It would take a full gale to fly that heavy beast of a kite! But my sound scientific judgement didn’t deter Vicki. Not at all. 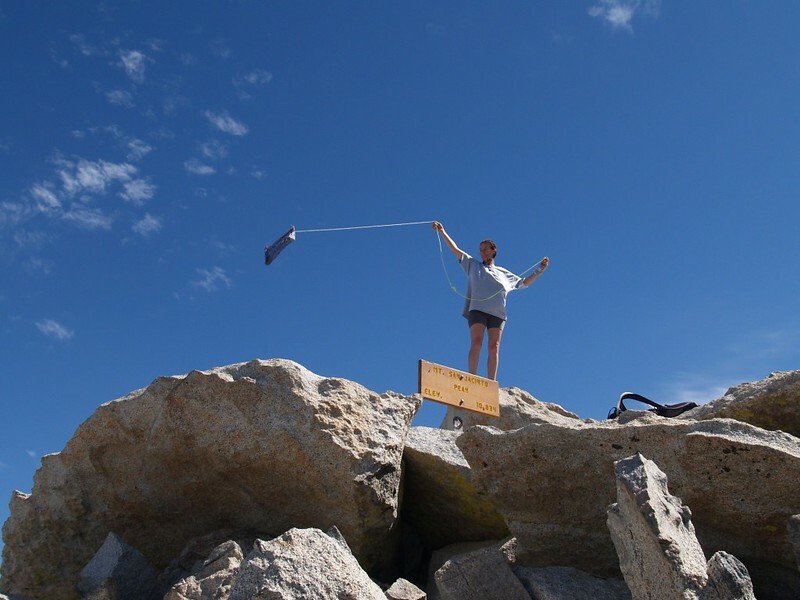 She confidently climbed up on the summit block and held up the kite on a short leash, waiting to see what happened. Unfortunately, while it was, indeed, quite breezy, the wind wasn’t constant enough. The kite would take off during a gust, and she would let out some line, but then the wind would die and she’d have to drag the poor thing back up the boulder. She tried again and again. I kept snapping photos, hoping to catch it when it was fully aloft, and I finally did it. 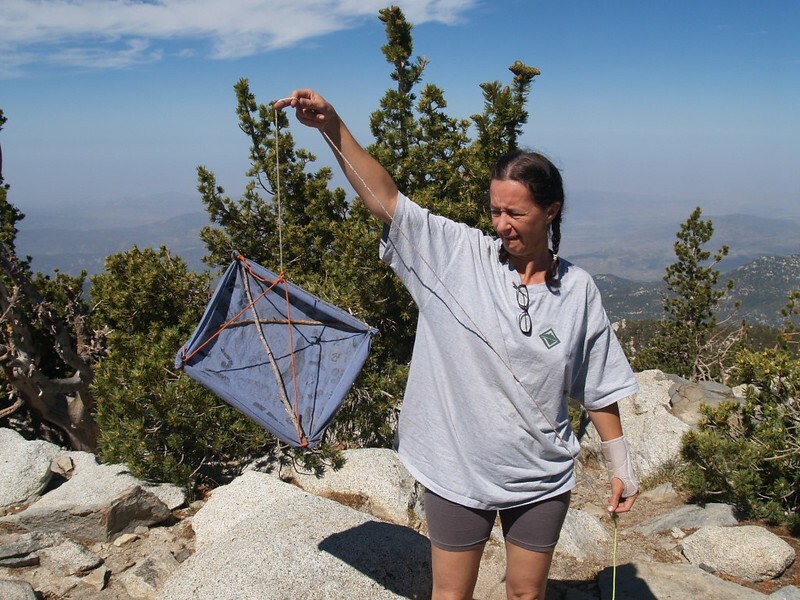 We had photographic proof that bandanna-kites will fly from the tops of tall mountains, and it’s published right here. I hereby certify that photoshop was not used to alter the image. Soon enough, the main crowd from the first tram car arrived on the peak, and it began to get crowded. So we headed back down the mountain to our campsite. It was an easy downhill hike, and the distance flew by. 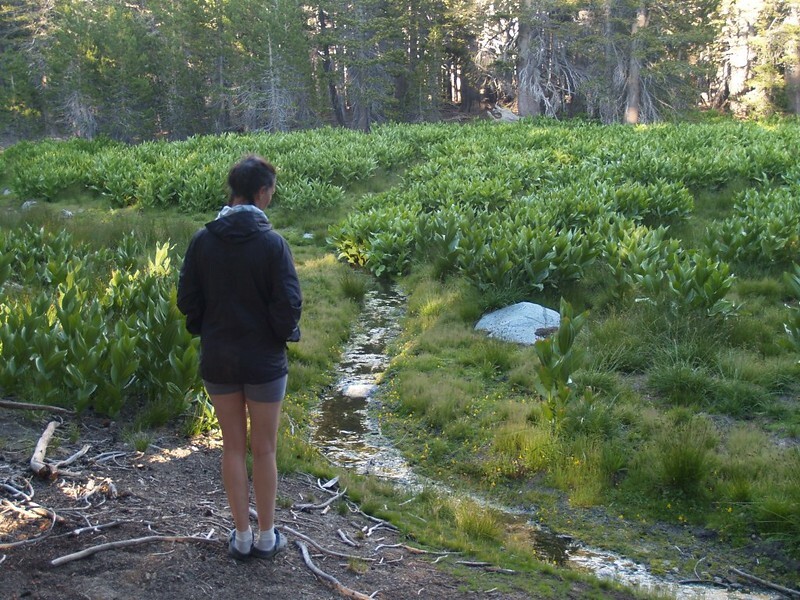 When we reached the meadow we decided to check out one of the other campsites across the stream. It was called “Owl’s Hootch,” which sounded pretty cool, but turned out to be a viewless spot in the middle of some scraggly pine trees. We decided that our current spot, “Thunder View,” was far superior. We got back to camp and ate some lunch. I tried to take a relaxing nap in the tent but Vicki had other plans. She decided that our clothes were far too stinky and needed to be washed. Yesterday’s climb on the Marion Mountain Trail made us sweat so much that she couldn’t stand the reek. I looked at her like she was nuts, but realized that it would be even nuttier to fight it. 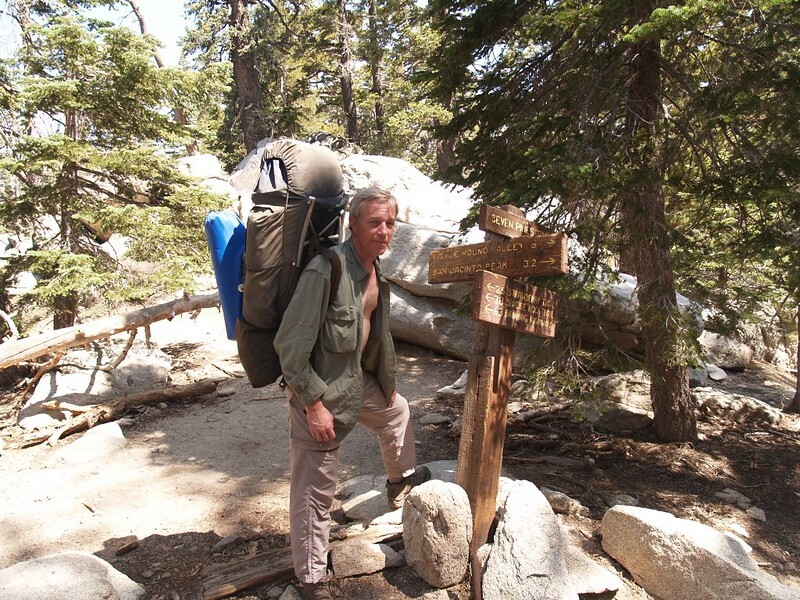 So we wandered down to the stream and filled up a large plastic bag full of water, then carried it back to camp. Vicki would use some biodegradable soap and her small plastic tub to wash our shirts and socks. While she did that I took the kite rope and strung up a clothesline between two trees. We wrung out the clean clothes and hung them up to dry in the sun. Naturally, just as we finished hanging them a large cloud began looming over the valley. Oh no! 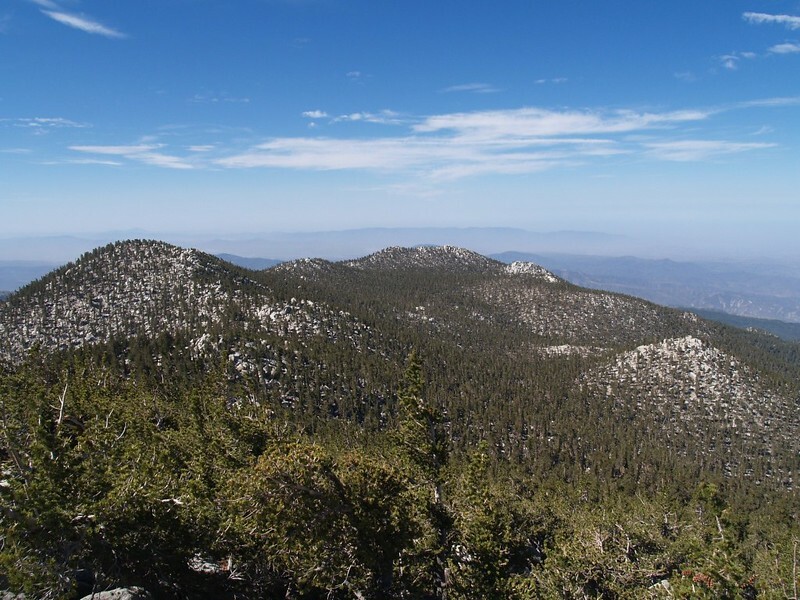 It was the dreaded “daily afternoon thunderstorm.” On warm Summer days the clouds often grow until they tower above tall peaks such as San Jacinto and San Gorgonio. Our campsite and laundry were suddenly in the shade. We heard a rumble in the distance. Thunder! And here we were in the Thunder View campsite! This was perfect! Large drops of rain began pattering on the tent. There weren’t a lot of them, but they were big. When that happens, it’s usually a good idea to prepare for a downpour. So we checked the campsite for anything that shouldn’t get wet and brought everything into the tent with us. Except the wet laundry, of course. No point in bothering with that. 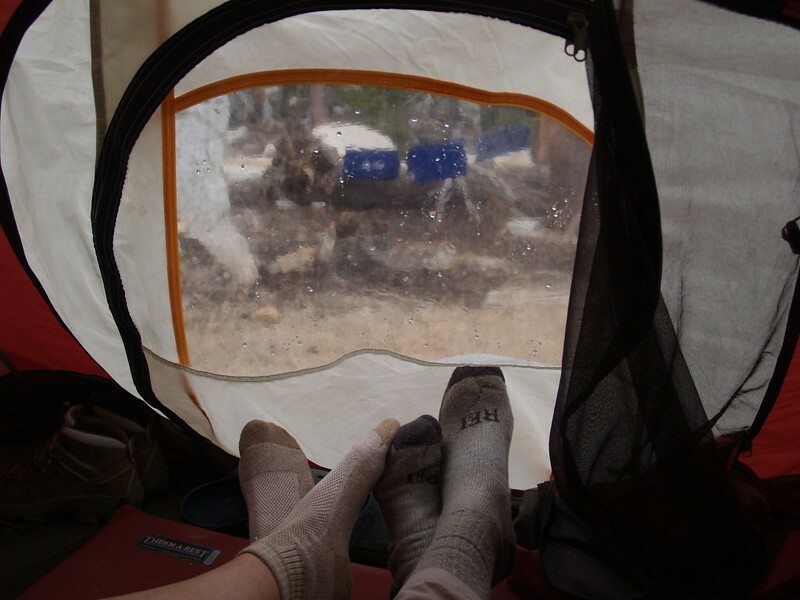 We zipped up the door and kicked back on our air mattresses, listening to the rain on the tent. We even had a clear plastic window on the door, so we could see what was happening outside. Rain is great when you’re camping, provided that you’re fully prepared. And this was no exception. It can even be a bit romantic. Unfortunately for us, the rain ceased soon after it started. It never really started pouring. At least not here. On the other side of the mountain, the downwind side, they were probably running for cover even now. Or so we imagined. It turned out that most of the lightning and rain were happening across the way, over San Gorgonio Mountain, where a towering cumulonimbus cloud had grown. Most of the rumbling was coming from over there. So, in effect, we were truly in the Thunder View campsite. As the afternoon progressed, the sun came back out. We took our nap and read our books. It was very mellow. We ate some dinner and took a walk around the campground afterward, to aid our digestion. 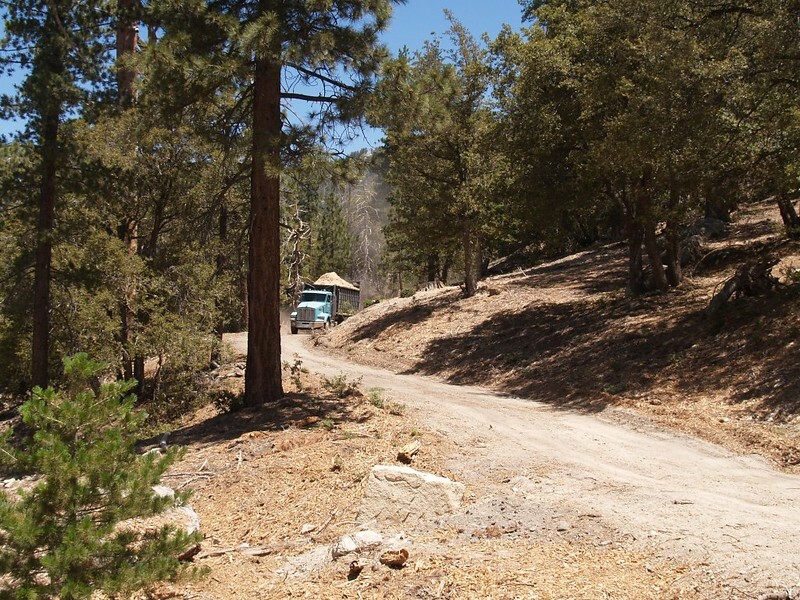 We met up with a number of people on the trail, and most of them were heading down into Idyllwild. 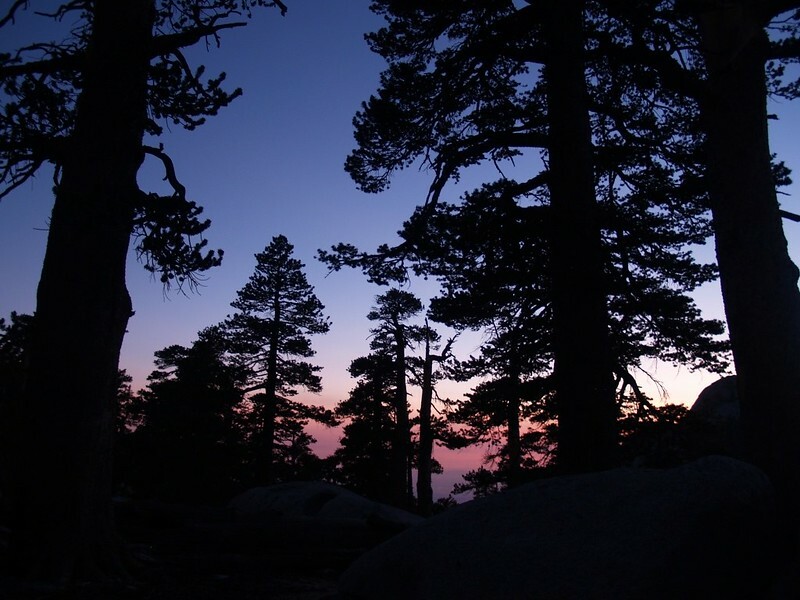 They already knew that they might be hiking after dark, but that was part of the fun. It got cool as sunset approached, and we dressed in our warmer night clothing. We checked the clothes on the line and They were mostly dry, so we brought them into the tent for the night. We’d be wearing them again for the hike out the next morning. All was quiet and peaceful and we were happy as we fell asleep in our little home away from home. Going to bed at sunset makes it easy to wake up at dawn. We were sad to be leaving, but we also knew that it would be a relatively easy hike to the car this time, provided that Vicki’s knees could handle the steep sections of the trail. So we didn’t plan on hiking fast. In fact, we had the whole day to get there. 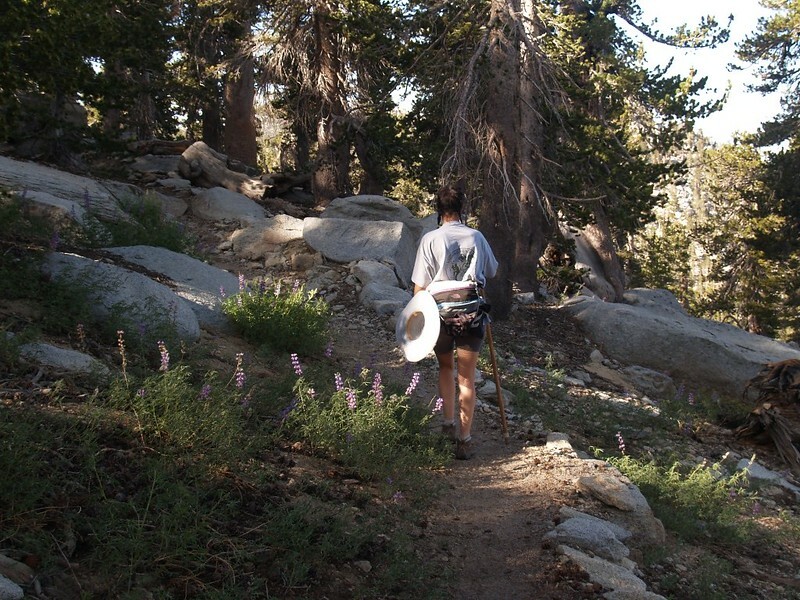 It was also Monday morning, so we knew that most of the day-hikers would be at work. We figured that we’d have the trail all to ourselves. Well, we were almost right, with one important exception, as you’ll see. We finished packing up our gear and double-checked the campsite to make sure we didn’t forget anything. There was no way we were hiking back up that steep trail. The sun was shining and it was a beautiful day. Best of all, we were hiking downhill! We made good time on the trail down to Deer Springs, where we took a short break. Vicki remembered how exhausted she’d been on the way up when when slept there for an hour. But not today. 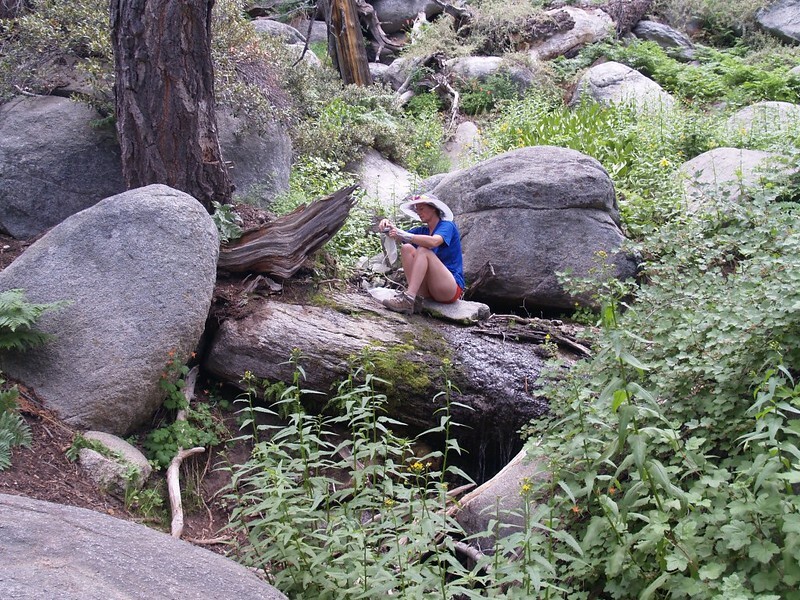 We simply sat and ate some snack while we listened to the stream hissing and bubbling and gurgling as it crossed the trail. It was cool, shady, and moist near the water, tucked away in this little valley. It was relaxing, but we didn’t stay there for long. 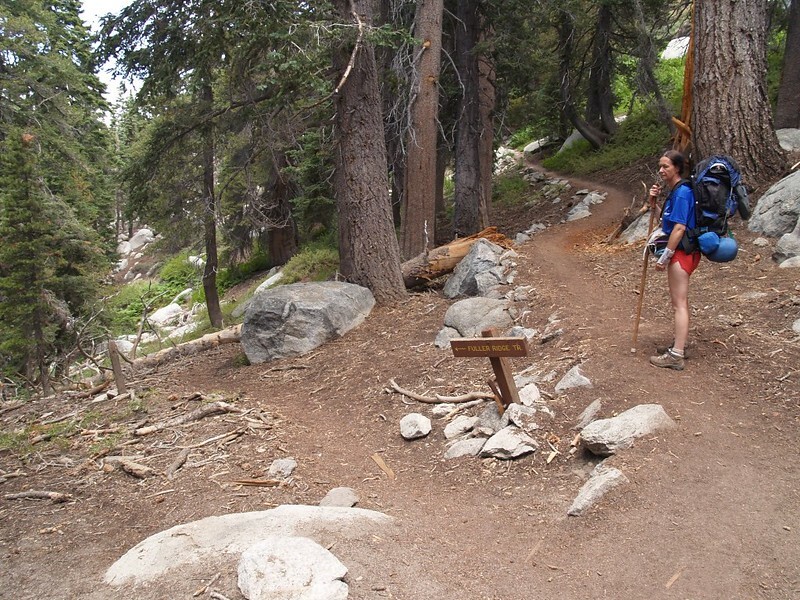 We hiked a bit further on the PCT and turned right onto the Marion Mountain Trail. That’s when the hike began to get seriously steep. Vicki took her time. 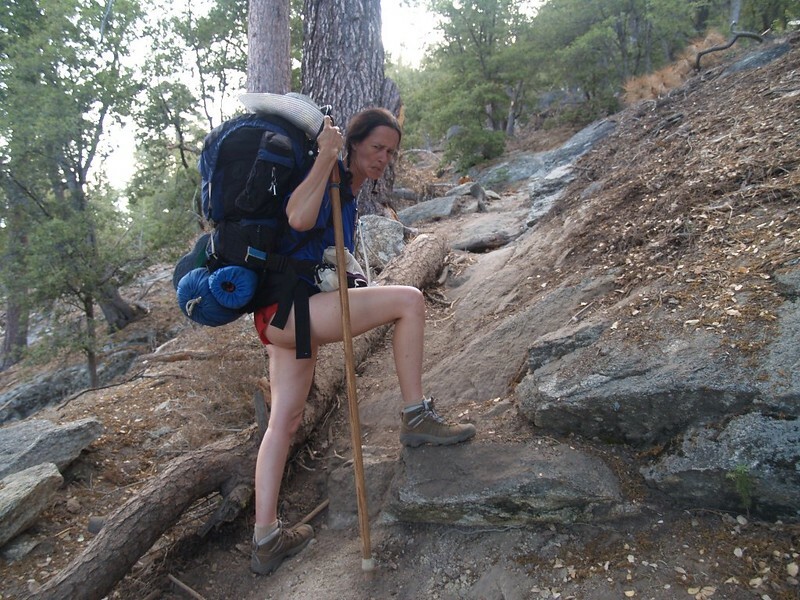 She used the hiking stick to bear some of her weight when the steps were too large. She also used it to keep her balance, to prevent a sudden slip or loss of traction from causing her leg to overreact and hurt her knee. This particular knee had been damaged several years before, and it was taking forever to heal because it kept getting re-injured. In fact, the knee was perfectly fine at the moment, but she was still being cautious. We had a big hiking trip planned for August, and she wasn’t going to let it get ruined. The hike downhill went much faster than before, but not because we were hiking faster. We simply weren’t taking hundreds of tiny rests to catch our breath every thirty seconds. We were harvesting some of the energy that we’d stored on the way up two days ago. Looking north toward Fuller Ridge. 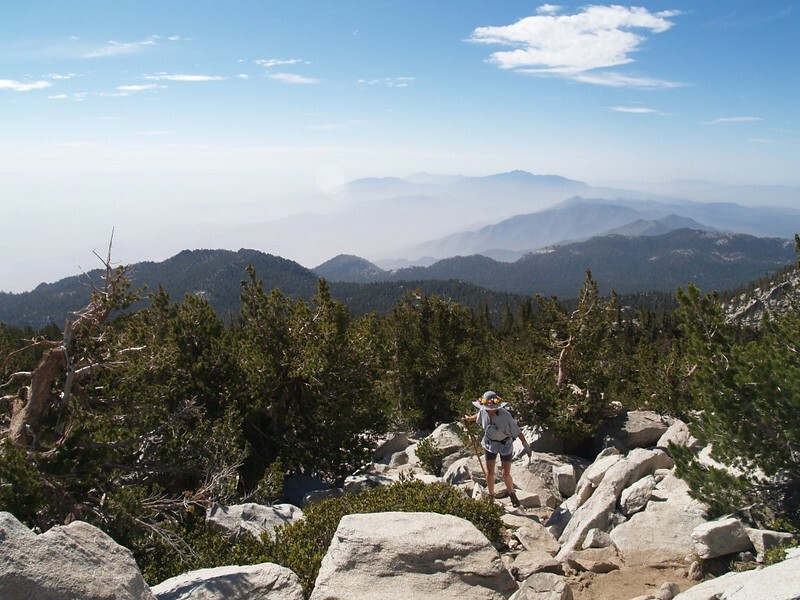 A new thunderhead was already growing above San Gorgonio Mountain. The Marion Mountain Trail also signaled the beginning of a sound we didn’t like: The sound of a helicopter. It was flying around the valley below us, and the engine noise was carrying everywhere. It was loud and annoying, definitely not in keeping with the “Peace of the Wilderness” that we’d been expecting. At first we wondered if there was a rescue operation happening down below. It’s hard to get angry at noisy machinery when it’s helping people out. However, it was certainly taking an awfully long time. What on earth was going on? Well, we found out soon enough, when we came upon a good viewpoint spot. It turned out that the helicopter was working with the logging operation! We saw it flying far below us with a long cable dangling beneath it. It descended out of sight for a minute or so, then the motor noise increased and it climbed upward and out over the valley. Tied to the end of the dangling cable were a half-dozen logs! It all began to make sense now. This was how they were able to harvest all of the small to medium sized trees on the steep hillside without heavy machinery and roads. And, since today was Monday, a workday, it meant that we’d be hearing this noisy helicopter for a long, long time. We continued down the trail. We left the state park and entered the national forest land where we’d seen the logging residue two days ago. The helicopter noise got much louder. We came upon a “DANGER Hard Hat Area” sign posted on a branch propped up beside the trail. Hmmm… This was not our usual sort of danger. We knew that there was a tiny risk of trees and branches falling down in any forest, at any time, but this was an entirely novel type of danger. It was, when you thought about it rationally, only marginally more dangerous than a typical stroll in the woods. All you had to do to avoid trouble was to stay out from under the helicopter’s direct path. Easier said than done! We hiked onward, keeping our eyes peeled for plummeting lumber. On our way down the trail we came across a warning sign that we were entering a Hard Hat Area. And we had no hard hats! As we hiked, we saw new evidence of the loggers at work. 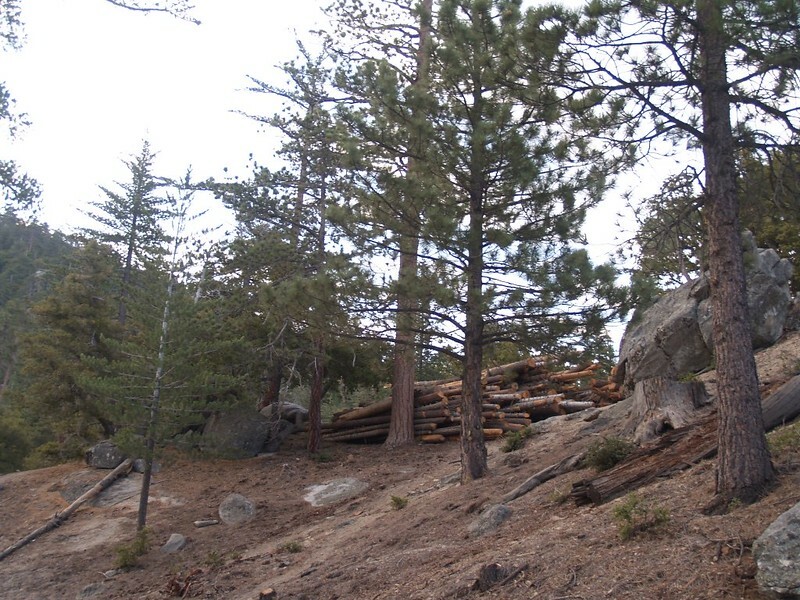 There were piles of logs along the trail, and other piles up on the hillside. We couldn’t help but notice the twenty-foot lengths of steel cables that were wrapped around many of the logs. They were coated with bright red plastic and had convenient loops on the ends, presumably to make it easy to hook them on to the helicopter’s main cable. They were strong cables, and there was no way they were going to break. The only danger was if a cinched log slipped out of their grasp. We were able to deduce the obvious rhythm of the lifting operation. They were working as fast as possible, but it still took several minutes between cycles. 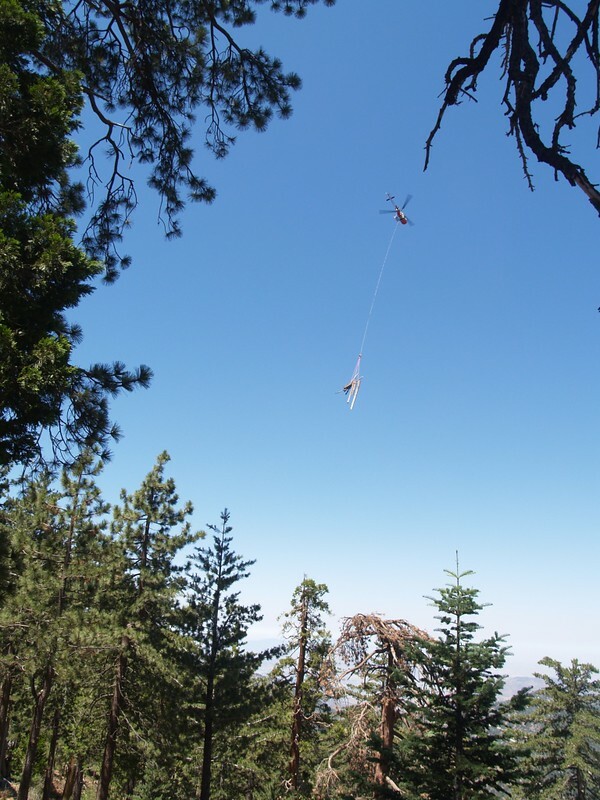 When we neared the operating area, we realized that they were lifting logs from way up above us on the hillside and taking them someplace down in the valley below, thus crossing the trail twice each round, but only once with levitating lumber. The unladen helicopter would climb up above us, then hover for a while as a number of steel cables and their logs were attached to the copter’s cable. Then we would hear the engine rev up and the helicopter would lift them high above the forest canopy. Once clear, it accelerated across the trail and bent its course steeply downward in the direction of the drop-off point. Then it would drone on for a minute or so as they unhooked the logs. When the engine began roaring we knew it was time for it to climb back for another round. We cautiously approached the zone of activity and waited for our chance. We got as close as we dared. The moment that a load of logs passed the trail was the time for action. It was really loud below the chopper so we simply nodded to one another and made our move, hiking downhill as rapidly as possible. We blazed right along, and easily made it across the danger zone in time. What had we been so worried about? It was a piece of cake! The logging operation was in full swing as we passed steel cables wrapped around groups of logs, ready for the helicopter. A bit further on, we passed by one of the young loggers on the hillside above us. He looked a bit surprised to see us, but we just waved and said hello. He waved back. Everybody is friendly in the forest, as we all know, so there couldn’t possibly be any problem about a pair of hikers not wearing hardhats out in the middle of nowhere. And, in fact, there wasn’t. It didn’t take long before we passed the active logging zone, and after that, we were free and clear. Interestingly, the helicopter stopped flying right about then. We checked the clock on the GPS. It was high noon. Ah! It was time for lunch. All the loggers were taking a break. But not us. This was our chance to enjoy the woods without all that infernal engine noise, and maybe we could get in a bit more distance before they started up again. Which we did. When we neared the valley floor the trail crossed a dirt road. We heard some rumbling in the distance and turned to look. It was a big dump truck with a load of shredded wood piled high in the back. We guessed that the smaller logs and branches from the helicopter were being fed into a wood chipper, as there were already a number of neatly stacked larger logs along the roadside. 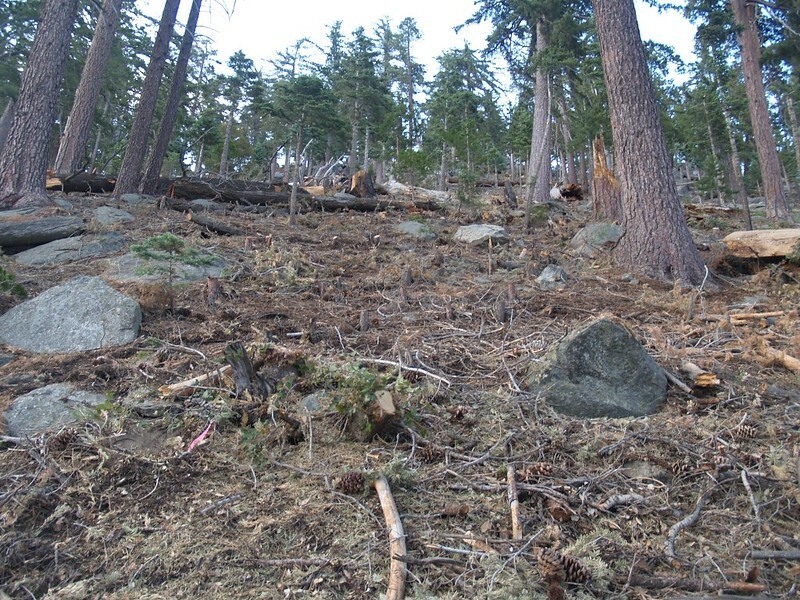 All in all, it was a well done operation: They thinned out the forest, making it healthier, and also carried out the cut lumber in the least damaging way possible, thereby decreasing the fire risk from excess fuel. We continued hiking until we saw the Marion Mountain Campground off to the right. 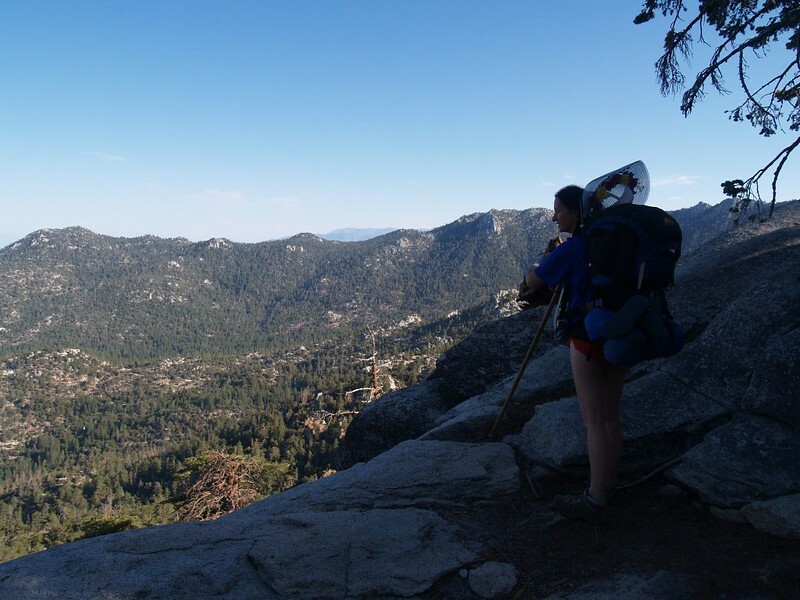 Vicki decided that her knee had had quite enough downhill hiking for one day, so we headed over there to sit at a picnic table and use the restroom. The wonders of civilization. Vicki sat and stretched her leg. She didn’t look too happy about it. I volunteered to go get the car at the trailhead and come back up here to pick her up, and she was more than fine with the suggestion. I also got lazy and left my big backpack there, as well. We loaded our packs in the car and took off our hot shoes. We had fresh socks and car shoes to wear, and they felt great. We sat in the car and relaxed for a bit, talking about the trip. 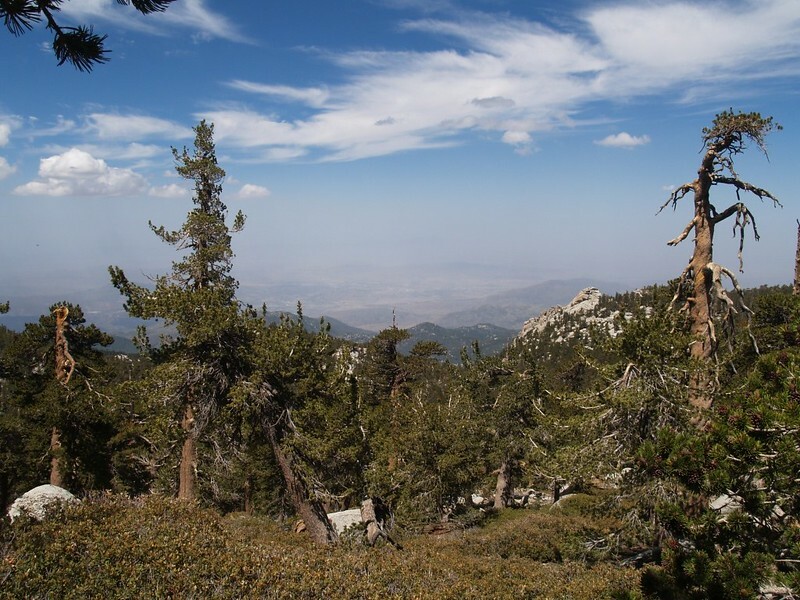 It had been a lot of fun climbing to the summit of San Jacinto Peak, and we really liked our campsite in Little Round Valley, but the Marion Mountain Trail was far too steep for our liking. In fact, we swore that we would never hike it again, and that we must’ve been at least temporarily insane to have attempted it in the first place. We’d find another route on our next trip. We also had to admit that the logging adventure was actually kind of fun, but the helicopter had been too loud for too long. Our hiking gear had worked flawlessly, and that was perhaps the most pleasing aspect of all. 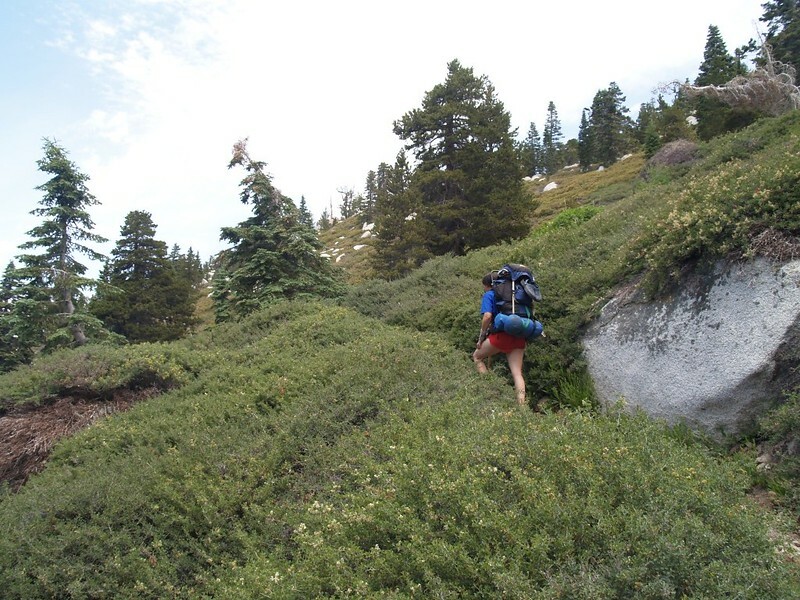 We had a week-long Sierra Trek planned for August, and we wanted to make sure that everything was working before we headed off into the deep backcountry. After that, it was time to head home. We waved good-bye and thumbed our noses at the Marion Mountain Trail as we passed by the trailhead parking on our way to the highway. We hiked you, but we didn’t like you. And then we took a few more deep breaths of cool, piney mountain air before heading back down into the heat of a Southern California Summer.